Kids may be out of school during the summer but there is always time for them to learn interesting new activities that expand their knowledge. Play time helps children practice, refine and build upon new skills. There are entertaining activities for kids ages 5 through 11 that teach them hand-eye coordination, measuring, music and more. 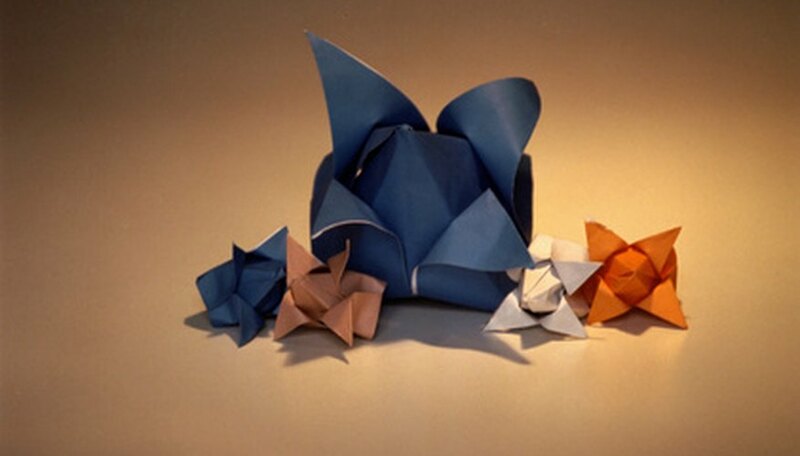 Origami is the Japanese art of paper folding to make objects such as animals or abstract shapes. Start out with easy projects like a hat, drinking cup or a small sailboat. Once your kids have a handle on how to fold paper precisely, move on to more difficult projects such as boxes, inflatable paper balls, birds and stars. You can use construction paper but origami paper is easier to cut and fold. Blowing and making giant bubbles is an activity that can include kids in the 5 through 11 age range. Older kids can make a list of items needed, such as a wading pool, water, dish soap, glycerin, hangers, hoops and bubble wands. They can help the younger kids collect the items, mix the bubble solution, make wands by attaching a loop of string through a hole on a wooden stick and fill the wading pool with water. Everyone can then experiment with which wands make the largest and longest-lasting bubbles. Have a band day with your kids. Make musical instruments such as rain sticks, drums, maracas and tambourines. Use an old soup kettle and stretch a balloon tightly over the top for a drum. Tightly stretch a balloon over an embroidery hoop for a tambourine. Cardboard tubes from wrapping paper filled with dried beans and rice make rhythmic rain sticks when you seal the ends with disposable drinking cups and tape. Make smaller maracas in the same way, using tissue paper rolls, dried beans, disposable drinking cups and tape to seal the roll ends. Poke craft sticks through one end of the maracas to create handles. Decorate them with markers, glitter, paint and stickers. March around playing the instruments or start a rhythm circle where one child plays a rhythm, the next adds a rhythm and so on around the circle. Spend a fun-filled day at the petting zoo with your kids where they can learn about animals by feeding, petting, riding them and learning about their babies. Some petting zoos offer pony rides and other activities, such as face painting and paper crafts to help fill up an otherwise boring day. Teach your kids, either singly or in a group, how to play a simple song on an electronic or computer-generated keyboard. Show them how to start the song by playing the first few notes and have them play the notes back for you. Proceed to the next few notes and have the kids repeat them until they have learned all the notes of the song. Play the song together with the kids. Older children may like to experiment with other tones or rhythms on the keyboard once they have learned the song. Make cookies or cupcakes with your kids. Have them find the ingredients and cooking tools for a recipe while one of the older kids reads to them. Preheat the oven then have the kids mix the ingredients together and prepare the baking pans. Let the kids fill up the baking pans, and have an older child place the pans in the oven and another remove them when they are finished baking.